But that doesn't explain the whole story. We believe there are two other key factors involved: racial animus and individual difficulty in connecting government action to lived experience. To measure racial resentment toward African-Americans, we created a scale based on five questions; for example, "Irish, Italians, Jewish and many other minorities overcame prejudice and worked their way up. Blacks should do the same without any special favors." To measure the impact of overtly racist stereotypes, we created a scale that combines eight questions that ask whether the respondent judges Asians, blacks, Latinos and whites as either "lazy or hardworking" and "intelligent or unintelligent." Finally, we created a scale to measure perceptions of economic insecurity using five questions that ask about economic peril. (For example: "So far as you and your family are concerned, how worried are you about your current financial situation?") In addition to these three factors, our models controlled for race, income, education, gender, religiosity, feelings about "illegal" immigrants, age, partisanship and political ideology. The undecideds I spoke to didn't seem to have any intuitive grasp of what kinds of grievances qualify as political grievances. Often, once I would engage undecided voters, they would list concerns, such as the rising cost of health care; but when I would tell them that Kerry had a plan to lower health-care premiums, they would respond in disbelief-not in disbelief that he had a plan, but that the cost of health care was a political issue. It was as if you were telling them that Kerry was promising to extend summer into December. 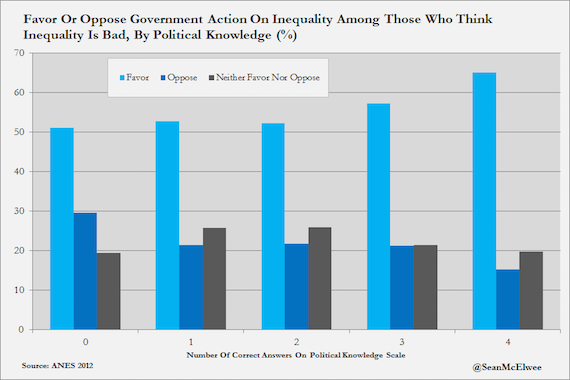 Specifically, petitioners tend to favor particularistic policy proposals over those with broader consequences and they are inclined toward post-materialist issues rather than redistributive ones. In older research, Nathan Kelly and Peter Enns demonstrated that as inequality rises, support for redistribution among Americans decreases. Research by political scientist Larry Bartels as well as political scientists Jacob Hacker and Paul Pierson shows that the general public has difficulty connecting public policy with inequality. Bartels observes, regarding the inheritance tax that benefits the very wealthy, "a very substantial number of people support repealing the inheritance tax because they mistakenly believe that their own taxes will be lower as a result." Political scientist John Sides finds that "correct information about who actually pays the estate tax does increase support for the estate tax." 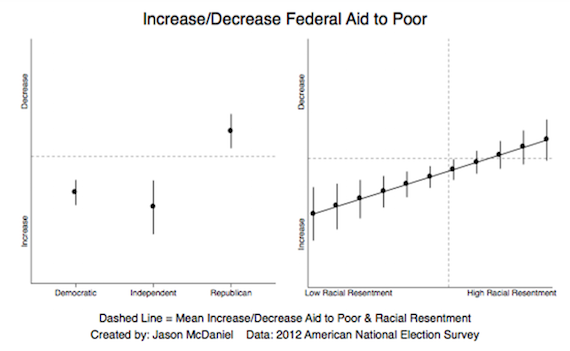 He finds the effect is strongest among lower-income conservatives. These results should lead progressives to reconsider the importance of race as a motivating factor on attitudes related to a wide swath of policy issues. Indeed, consideration of race should be central to analysis of even issues, like economic inequality, that seem to not be about race. But further, they show that the idea that Republicans will ever go so far to the right that Americans will reject them is unlikely. The sad reality is that most Americans don't see a large causal connection between government policy and their lived experiences. Instead, they'll likely blame the poor, immigrants and Black people.